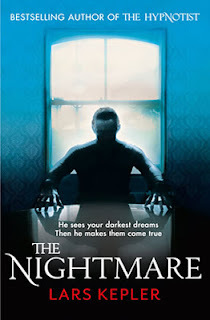 THE NIGHTMARE is the follow-up to the best-selling THE HYPNOTIST and sees the return of Stockholm Police Detective Joona Linna, now as the lead character. Joona is drawn into two separate cases. Firstly through a friend on the force he's invited to the possible crime-scene of the death of a Government official, Palmcrona, who has the final responsibility for overseeing Sweden's sale of arms to foreign countries. The death looks suspicious but could be suicide. When Joona goes to the pathology department, the expert, nicknamed The Needle, shows him the body of a young woman who died of drowning but whose body was found in the bedroom of an abandoned boat. Joona begins to investigate. The reader knows who the dead girl is and what's happened and that two people are in mortal danger but it takes the police longer to raise the alarm and organise a proper search. Eventually Joona who is joined by the security service's (Sapo) Saga Bauer (a fey looking woman who boxes but is nevertheless not taken seriously enough by her male colleagues) and they begin to unravel the reason why so many people are dying. This is a big book - 500 pages - and several characters are introduced and the plotting makes good use of their personalities and talents, though an enormous suspension of disbelief is required at times. The Swedish authorities fare slightly better in this book than they did in the previous one in terms of competency (but not body count) though they make a couple of significant, plot-driven errors; even Sapo swiftly drop their silly ideas regarding terrorism and toe the Joona-line. Ultimately, THE NIGHTMARE is a nail-biting thriller, with chase after chase after chase and tense situations, which culminates in a slightly implausible showdown with the main bad guy. It's told in present tense which adds urgency and the shortish chapters end on cliffhangers. The likeable Joona is still a mystery, he has an uncanny ability to read crime scenes and know what's gone on and is a bit of a hero in the force. There are some small teasers regarding his personal history dropped in, but two tantalising threads regarding his love-life, past and current, are left dangling; I believe a ten-book series is planned so maybe they'll be answered by the end. Despite some other minor issues – slight repetition of facts, over-detailed descriptions and a US/UK English hybrid of a translation, I was completely enthralled by THE NIGHTMARE. I'm very much looking forward to book three, THE FIRE WITNESS.